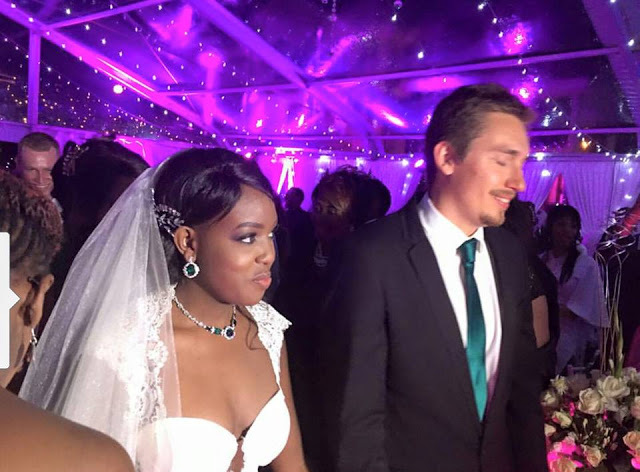 It was all pomp and color in a flashy event where one of JCC pastor Allan and Kathy Kiuna's daugter's walked down the isle with her 'Mzungu' boyfriend. The wedding is alleged to have taken place in a private ceremony that was only attended by family members and close friends. However some photos managed to leak on social media and as you know Kenyans are not left behind with their all sorts of criticism when there is something to talk about. here are the sentiments laid down by those who managed to come across the photos. 'Mummy na Daddy (Kiuna) vile wako na watoi elfu, why weren't they invited to attend their sister's wedding?" ama "Hao ni waku changa doo pekee yake"
I see/find nothing special.....i loath those who do sponsor these kinda shietS. Mkaliwe chapati hapo hapo, mahamri vile vile, vitumbua hata tusiongee.....vile grammar ni shida kwa wengi hii richness ya some pastors ni questionable....then to preach against Vanity?? MadamS PAHLIIIIIIZ...grab that corner bench there >>>>>>>"
She dateted WEALTHY BUSINESSMAN for only four months.isokei .